First it was the pumpkin buckwheat bowl. Then came the Banana Raisin Pumpkin bread. Next up was the Pumpkin Black Bean Soup. Then last night was the pumpkin beer (which, btw, is delicious!). Now, this morning, I found myself eagerly jumping into my car, blasting the heat because it’s a chilly 40-something degrees this morning (not quite ready for THAT yet) and heading out to celebrate Coffee Friday with a delicious pumpkin spice coffee from Dunkin Donuts. And as if that wasn’t enough, there may or may not have been a couple of pumpkin munchkins that somehow made their way into my car…but not into the house. Woops. Too bad these little guys weren’t free. I think I’m loosing my touch. Then again, maybe it’d help if I didn’t walk in with a severe case of bedhead, looking like a total ragamuffin. Ahh well. As for my real breakfast this morning (since munchkins don’t count), I decided to go sans pumpkin with a cereal combo. Now, it’s time to get going with my to-do’s. Happy Friday!! Do you consider yourself to have an addictive personality? I just wanted to let you know that 2 weeks ago, after my race we went to DD and I ordered 1 munchkin (thinking of your posts) hoping it would be free but lo and behold they charged me the 25 cents. haha! Oh well, I tried! I love that you think of me with munchkins ;) That's a bummer it wasn't free, but at least they let you only get one! Most of the time they make me buy 4! I love the pumpkin too, but I am lucky enough to have it year round, so I was making pumpkin flavored things in July. I'm trying to take a breather, and bring it back hard come October! I have the longgggest food ruts. I basically eat oats every morning topped off with uncle sam's. Lunch is almost always a salad and pb and honey on a slice of whole wheat. I totally get the pumpkin thing. It's soooooo good. Plus, they're just so damned cheerful! I love pumpkin, especially in quick breads. And I know what you mean about the personality. I'll love something so much that I have it all the time and then get sick of it. Yes! I do! I get hooked on something and don't stop until I am sick of it! i think i definitely have qualities of an addictive personality. Not really to an extreme though-- luckily (like you) all my "addictions" are on the healthy side i.e. 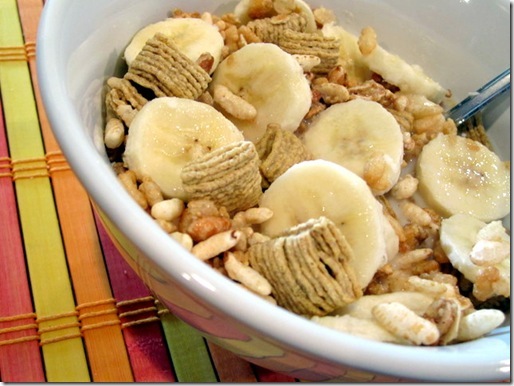 exercise, eating almonds with raisins/craisins, oats, etc. ;) Have you tried pumpkin enchiladas? sounds super gross but I found the recipe on one of the blogs I follow (and can't remember which one) but it's definitely SO GOOD! i am the same exact way! i think i just follow the seasons thought. summer is BERRY everything! when fall comes, it is definitely pumpkin. have a good weekend girl! I totally agree with you on the changing of the seasons :) Thanks Lee, you too! P.S., on Monday, I went to DD and asked for 5 munchkins, and they ended up giving me 15. I thought of that post where you were so good and actually saved the extra for a different day, but alas, I do not have such self-control. All 15 ended up in my belly. Can you say sugar overload!? This morning at Starbucks, I swear 95% of the drinks that came up at the bar were pumpkin something! I guess it's just that time of year...but we still have two months until Thanksgiving...pumpkin pie! I have SUCH an addictive personality it's not even funny! When I like something, it's all I want to eat/do till the point that I can't face it any longer! Although some are still going strong like oats, yogurt, apples, egg whites, peanut butter and marinara sauce! Pumpkin overload! :-) Those munchkins look delicious! I am totally not an addictive personality. I get bored with things super-easy. Have a great weekend! Oh yes!! This happens to me all the time. When I first discovered overnight oats, I had them almost every day. Then I went on a smoothie kick as well. Then cereal. I have them so much then I completely switch! omg the pumpkin glazed doughnuts from Dunks are the BEST. They are a current major weakness for me. If I had to guess, you'll be on to the pumpkin oatmeal by next week. ;) Happy Friday! Don't worry! You are definitely not alone in this. I had a pumpkin flavored k-cup coffee this AM and already thinking about the possibility of grabbing another pumpkin flavored coffee this afternoon... I cannot get enough. I go in spurts. I'll be totally into something for weeks, then not have any craving/desire for it for months and months. Then I'll rediscover it and fall in love all over again. 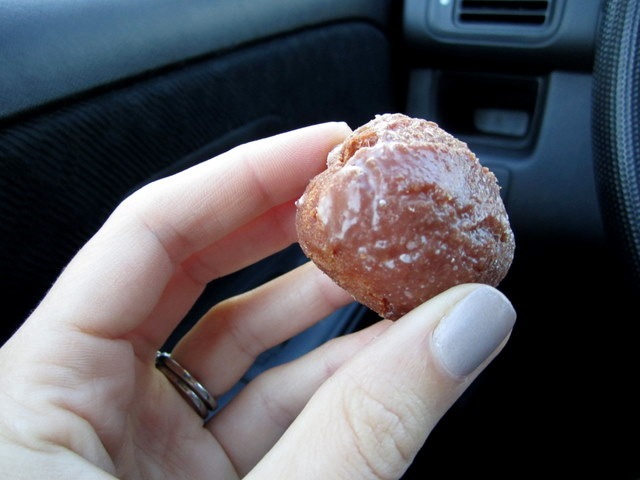 Wawa has a pumpkin spice doughnut that is pretty awesome. I am the same way with pumpkin! I think mid September is a perfect time to start indulging in the obsession :) I also didn't know that Dunkin' Donuts had pumpkin munchkins. Thanks for sharing that! I'm totally the same way!! I've been making the same quinoa dish & bringing it to work for lunch for WEEKS! I'm very much an addictive personality, and really struggle to try to tun that away from junk to good things. Back in high school, my mom and I started jogging every weekday. It got to the point where I never wanted to stop. I loved our morning jogs and was sad when they stopped. I need to push myself back to the gym, so I can get addicted to it again. When it comes to food, my main addiction is chips and salsa. I just love chips and salsa. Before I started getting healthy in high school, I would eat an entire bag of chips and almost a full jar of salsa per DAY if I wasn't paying attention. Don't like pumpkin, though. I'm going to try to make some pumpkin pies this year, because hubby just loves pumpkin pie. I think I love pumpkin so much because it reminds me of fall, home, and the holidays. :) I'm ready for a pumpkin donut! I am addicted to pumpkin too! Yesterday I made pumpkin peanutbutter muffins! I never liked pumpkin when I was a child/teenager/young adult...but, the last ten years or so...I LOVE IT! : ) (Although, I can't quite eat straight-up pumpkin pie yet!) Happy almost Fall! i have an addictive personality as well. once i find something i love (pumpkin!) I'll also over do it until I hate it for a few months. I've done it with cream of wheat and greek yogurt so far! I definitely have an addictive personality. I could eat the same meals all week and be perfectly content. And pumpkin out of the can is delicious... Or maybe I'm just weird. Also, am I the only one who looked at your cup, and thought it said "pimp"? Oh yeah, definitely! I get into different addictive phases..pumpkin in the fall, protein in the summer, oatmeal, bananas..
Oh yes I tend to have a very addictive personality. Gosh I'm addicted to pumpkin, almond butter, fitness magazines, trash magazines, lifting weights, and shopping. All pretty good addictions i think other than the trash mags. Oh my gosh, I am the SAME way! I love pumpkin and literally wait all year for DD's to come out with the pumpkin flavor--and then next month, the gingerbread flavor!!! I love both pumpkin and gingerbread and am loving all of the recipes I've seen popping up including pumpkin! PS: kettlecorn is my current "addiction" so I'll have to keep an eye out for the 100-calorie bags! Oh I definitely have an addictive personality! Good thing I'm not addicted to anything bad! I'm officially on the lookout for pumpkin ice cream. Do you have a favorite brand that makes it? I'm not talkin' frozen yogurt or anything of that sort. I think Haagen Dazs brings out a pumpkin flavor around this time of year. Hmmm. If you find a good one (which I hope you do, since you're on such a pumpkin bender), please let me know, because pumpkin ice cream is probably one of my favorite things ever. Woohoo for fall flavors! 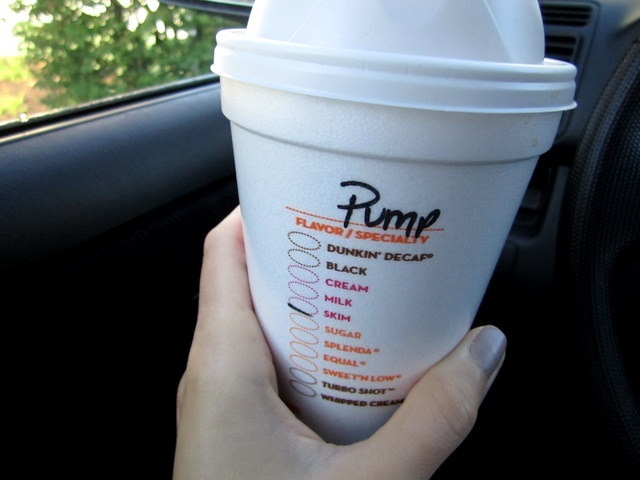 I wish there was a Dunkin' Donuts here so I could try this pumpkin coffee! lol. Pumpkin Spiced Latte's at Starbucks are just too sweet for me regularly! lol. I definitely feel like I have an addictive personality and it isn't always a positive in my case. I just try to roll with the punches as they come. I haven't jumped on the pumpkin bandwagon, but I do have an addictive personality! I'm glad I discovered this about myself because it allows me to stay away from things that will help me further procrastinate when studying (yep, I don't have a facebook for that reason!). Like you, these addictions come in bouts! I'll go strong for a few weeks on something (making smoothies with my magic bullet!) Then it dwindles down and and I find something new to be addicted to. :) what a ride, yes? I definitely go through food phases where I can eat something every day, multiple times a day for months. I have the same addiction to pumpkin but I totally CAN eat it out of the can. I like it that freakin' much! I must go to DD for those pumpkin munchkins! I love that pumpkin is coming back into my life again! haha I pretty much have the same thing (iced coffee and overnight oats) for breakfast every day and I never really get tired of it either! Add ins change, but it's the same basic breakfast every day.